Thanks for recent post on replacing the rear bearings and hub. It was as much a pain as it sounded like. BUT...It's done. The hub installation tool worked slick as S#!+. I did have to buy a 24mm deep socket to hold the inner nut (on the tool) still as I tightened the outer nut. I ended up using the old hub as a tool to drive in the new hub. It seemed like the only foce was directed on the outer race. Has anyone done this and will I be okay? That's where you want to apply force when re-installing the hub, the outer race. As long as you're pushing that is. You want to apply pressure to the outer race when installing bearing into trailing arm. Just the opposite of what you described to install hub.........you should apply pressure to inner race of bearing (from inboard side of swingarm) while pushing hub into rear bearing. This is what prevents load being put on balls/cage/inner race. I'll attach pic of tool I used. This idea came from the tech articles but what I had laying around my shop that worked. 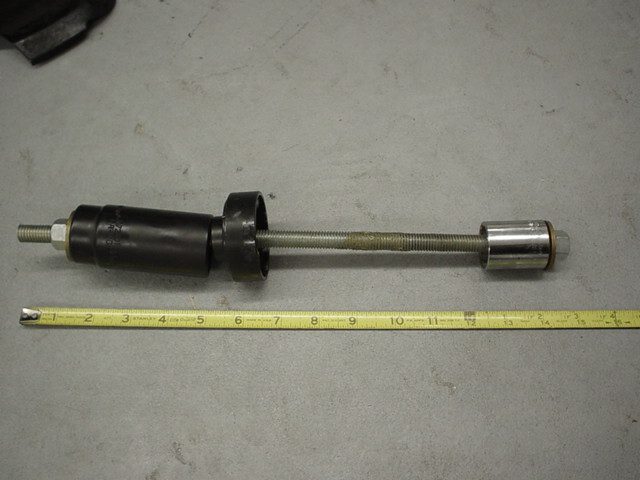 Parts consisted of 30mm deep socket (used to loosen stub axle bolt) slipped over a porsche ball joint removal tool.......this part goes inside swingarm and supports inner race. 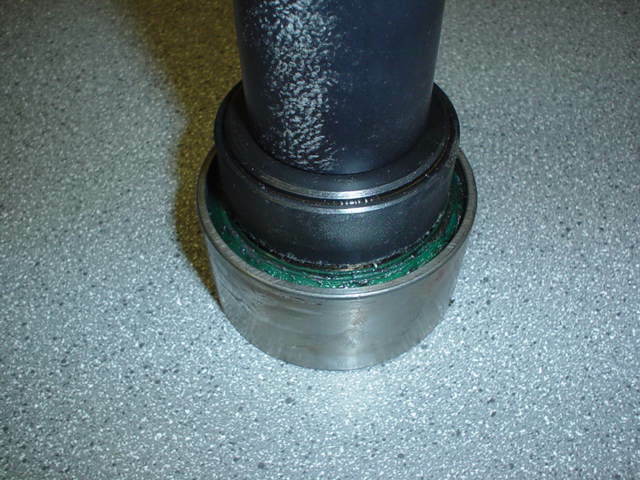 Any socket with a larger diameter than hole in hub can be used for the outboard work. Just so there's no confusion, I snapped a pic of the surface that pressure should be applied to when installing hub. I was referring to installing the bearing. John is correct, when installing the hub, the force should be applied to the inner race of the bearing. But if I understand correctly what Kerry said, and I think about how you might use the old hub as a tool to install the new hub, I have a feeling you're in trouble. I did used a similar tool to install the hub into the bearing. 5/8" rod and some nuts & washers. The washers were just big enough to fit on the inner race only. I used the old hub to drive in the new bearing into the trailing arm. I put the new hub into the frezzer and had a sopt light on the trailing arm. I was hoping the bearing would have gone into the trailing arm on its own more.. BUT the hammer and old bearing work very well. I just kept moving the impact zone around the old bearing's outer race. I guess I'll find out if the bearings are trashed soon.